Somewhere in Eastern Europe: "LEAVE GLENN ALONE!" So it looks like someone decided to take to web site proxies to distort the results of our Buffoon of the Year polls. Over 500 fraudulent votes came in today alone - thanks for all the site traffic! Buffoonery within Buffoon of the Year! I love it! We couldn't be more pleased because it's given all of us here quite the laugh - especially because this flood of votes came in for the opponents for Republicans For Change and our good buddy / modern-day troubadour, Glenn Nocera. That people care enough about our little site and show to skew the voice of our listenership is proof positive that you really ARE buffoons! So I guess that explains who was behind stuffing the ballot box! Luckily, we backed up the results from the election daily, so fear not! Your votes will not be tainted by the pond scum. So we'll be going by the ACTUAL results that came in from the more than 150 unique visitors that didn't patch yourself in from a server in rural Lithuania or somewhere like that. 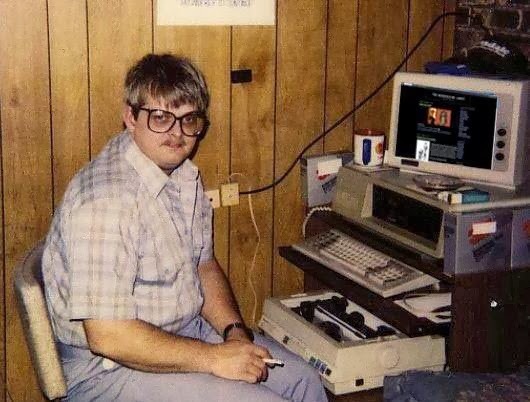 To those of you affected by this act of cyber-buffoonery, we apologize for cutting things short. For those of you who tried to hijack BOTY2013, thanks for the giggle-snorts. BOTY2013 will go on, and the semi-final results will be unveiled at midnight tonight! 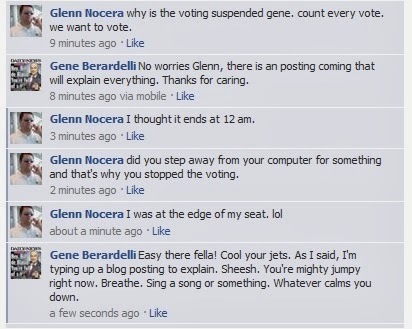 Glenn can vote all he wants as soon as he stops being whiny and The Nocera Tapes come back. Hey Gene. Love the pic of you back in the day. You still look like crap but skinnier.